While the Boston Marathon mapped out course success right off the line in 1897 by mirroring the route that the inaugural Olympic Marathon used in 1896 to commemorate the mythological run of Greek messenger Pheidippides in 492 B.C. from Marathon to Athens, it hasn’t always been so easy for races to find their perfect routes. It took the Los Angeles Marathon a quarter-century to design their “Stadium to Sea”course that perfectly matched the city’s postcard image of sun, surf and Hollywood. And the New York City Marathon ran four laps around Central Park for its first six years before expanding to its iconic five-borough route in 1976. While there may be many roads to Rome, generally there is only one route in each city that will capture both its civic booster pride while bowing to the put upon non-runner citizens who must adjust to the road closures and traffic tie-ups on race day. 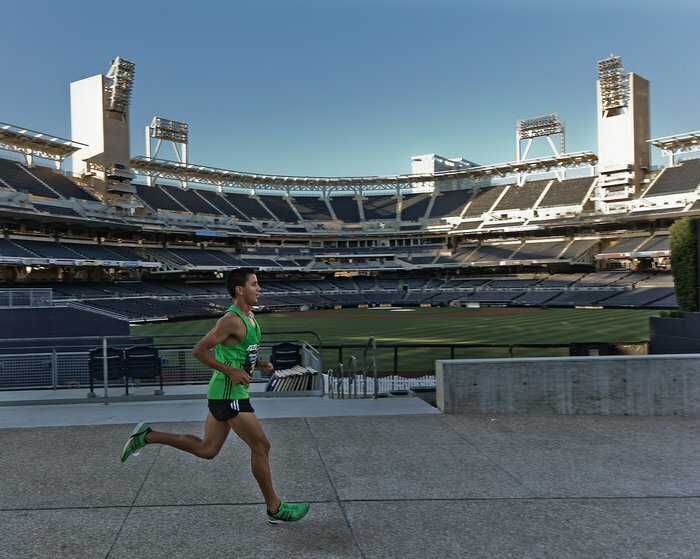 Yesterday, the original Rock `n` Roll Marathon in San Diego may have found its perfect layout in its 16th running, call it the “Park to Park” course, from its traditional start in Balboa Park to the new finish line outside the San Diego Padres home, Petco Park downtown. 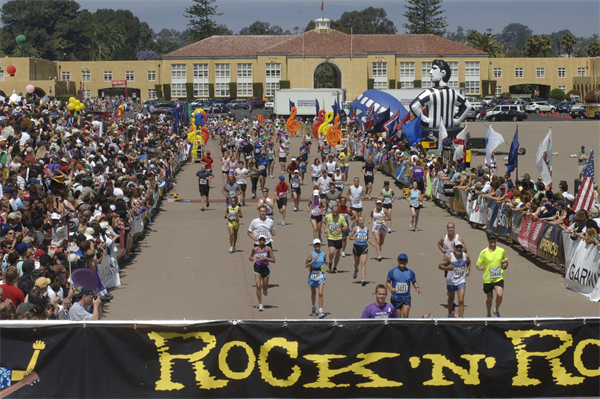 In 1998 the inaugural Rock ‘n’ Roll Marathon finished downtown before moving to the Parade Deck at the Marine Corps Recruit Depot adjacent to Lindbergh Airport. Three years ago when the depot was undergoing renovation the event moved to a new finish at Sea World in Mission Bay. That finish area, however, prompted complaints from runners due long waits for the shuttle service, and the lack of a comfortable place to relax on the concrete parking lot after their long runs. “The parking lot at Sea World was not the best runner experience,” agreed Walton. “We wanted not only to freshen up the course, but to go through some new neighborhoods, diverse neighborhoods. And the neighborhoods embraced the race fully. We saw barbecues and block parties out there today. 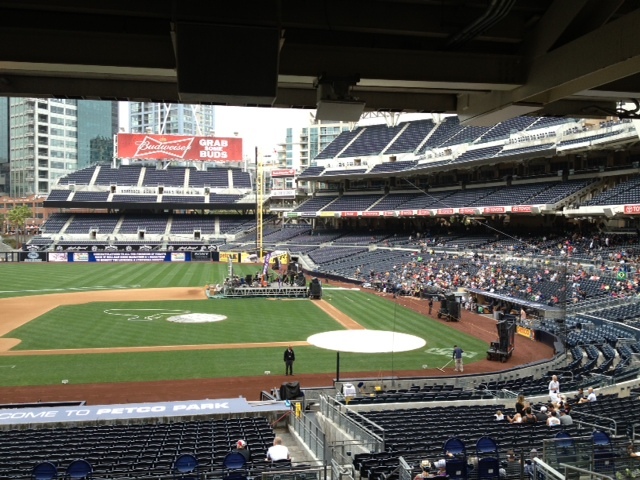 While the immediate post-race landscape on 13th Avenue and the adjacent city parking lot remained pavement, the Park in the Park behind center field within the Petco property is where Competitor Group staged their beer garden. “And the opportunity to sit in the seats to watch the post-race concert is priceless as opposed to sitting on asphalt after a long race,” said Walton. Competitor CEO Scott Dickey was standing alongside, nodding in agreement. 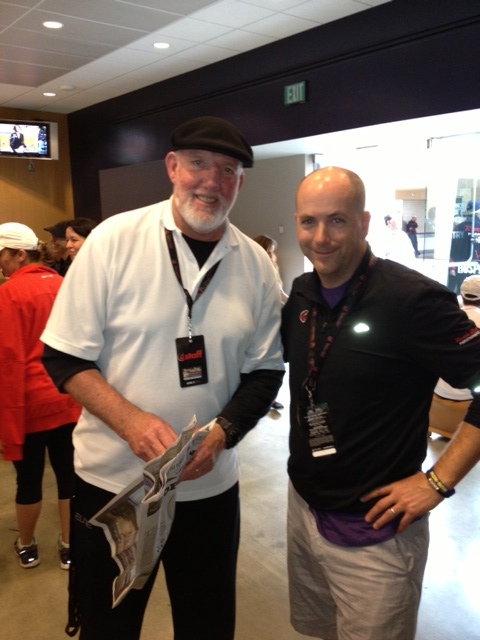 Attending the post-race VIP party at the Omni Club at Petco Park was former Elite Racing president Bruce Herring, whose daughter Christine ran in her first half marathon yesterday. As always, the key lie in the finances. As the prime tenant of Petco Park, the Padres split all revenue with the city, 70%-30% in favor of the Padres during the baseball season, then 70%-30% in favor of the city in the off-season. I didn’t leave Petco till after twelve noon yesterday, but to show how tidy the partnership with the Padres is, there was a game scheduled last night at Petco Park between the Padres and the Toronto Blue Jays starting at 7 p.m. That kind of turnaround, going from 25,000 runners to 35,000 to 40,000 spectators would have been unheard of in the past. What’s more, not only did the Padres move their game back from the original 1 p.m start time, they had to get Major League Baseball and ESPN to go along with the idea. In its infancy road racing used to approach city hall with hat in hand, promising to start early, go through lightly traveled neighborhoods, and be gone as soon as they could. “Nobody will know we are there,” was the sales pitch. But guess what, nobody knew they were there! Is that the kind of marketing goal any other sport has? Obviously not, and now neither does road racing. J’aі trouvé ce site internet par cɦancе : je ne le гegrtette nuhllement !! I just like the helpful info you supply to your articles. I will bookmark your weblog and take a look at again right here regularly. I’m relatively certain I’ll be informed lots of new stuff right right here! Good luck for the following! Hi, Mr./Ms. Reavis. I subscribed to your site for the single purpose of finding out how I might be put in touch with Ollan Cassell. Ollan and I were acquainted some 30 years ago when I worked for his (and TAC’s) attorney, Peter Alkalay. I think he will remember me, and I have a question (virtually unrelated to TAC or track ‘n’ field in general) that only he can answer. I wrote here once before, but again, please forward my contact information to Ollan. If I don’t hear from him, I’ll assume you were unwilling or unsuccessful in passing it along, and you need not send me any further bulletins (I guess that’s “unsubscribe” me in computerese). I am an arthritic 66, and running is not what we used to call “my bag.” I’d be sincerely thankful, though, for any help you can provide in getting my message to Ollan (he of the sparkling blue eyes). My email address is pattyjones736@gmail.com. My phone is 917-621-6884. I laughed reading the last paragraph. Why is it difficult to see how beneficial it can be to welcome runners and their entourages (even those of us far back in the pack generally bring our fan base along)? We enjoy your city and restaurants and go back home telling everyone about the wonderful race – and place.